here we share some information for low-cost travellers. Musanze, formerly Ruhengeri, it´s a medium town, 60 km from Gisenyi and close to the Uganda border (only 25 km), 100 km north from Kigali. Very beautiful area, surrounded by volcanoes and lakes, a few km away. Worth going, even if you don´t track the gorillas who live in the close volcanoes mountains. If heading from Rwanda to Uganda don´t miss this area, the landscape is really incredible. We really recommend you choose this northern route, Musanze-Kisoro! And YES, there´s public transport! There a bus station in the center of Musanze, quite well organised. Also many small vans stop all around the town. Price: 1.100 F, 1h15. All day, different companies. Beautiful road passing tea plantations. Many minibuses departing all day long to Kigali. Buses (big coaches) heading to Kampala (Uganda) pass the town around 17:00. Many vans going to neighbour villages. There are so many villages around, on the first slopes of the volcanoes (south of the Volcanoes NP) and around the lakes. If going to the twin lakes (south-east), ask as we saw a public van also in that area. There are vans going from Musanze to Cyanika -Uganda border (price: 400 F, 45 min). YES, many guide books give wrong information! Then from the border, many taxis and mototaxis to reach Kisoro (10 km away, first town in Uganda). No worries! Many mototaxis and taxis around Musanze, like always in Rwanda. Walking in the center, we just saw one cheap lodge, Tourist Resthouse (price: 8.000 F for a double room), quite basic. It´s easier to find expensive hotels in Musanze and its surrounds, specially focused on groups who go and see the gorillas. We were lucky as we did couchsurfing with Hormisdas and his family. African style! It´s quite a big town, so you will find banks, internet, etc. 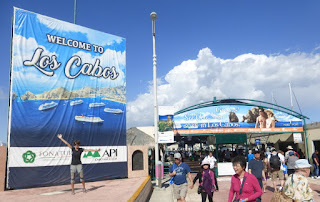 There are local restaurants, shops and a market, in the center. Even if you don´t stop in Musanze, just enjoy the route and views! Lake Karago, 1.5 km from Mukamira (off the main road, 20 km west of Musanze). You can get there by any Musanze-Gisenyi minibus. We just passed it on the way. Ask in Musanze for vans going to the area (villages, but limited public transport). Roads are dirty and really bad. We visited the area with a private 4WD car, with our couchsurfing host (we paid the petrol). We didn´t go to the cave and natural bridge (2 km west of the Musanze center, on Gisenyi road, in the football field of a school, Opravia). Enjoy the views from Gisenyi to Musanze: very fertile land, many terraced fields, tea plantations that you see from the road (Pfunda Tea Plantations has an entrance fee). 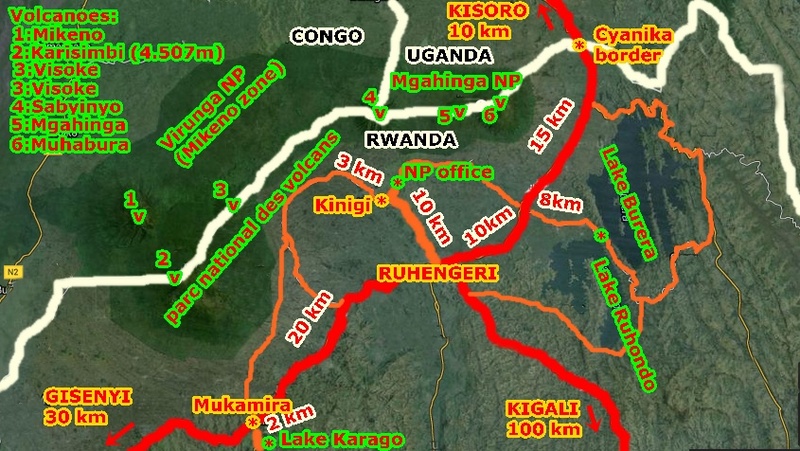 They are many volcanoes, in all this border area shared by Rwanda, Uganda and DR Congo. Even reaching 4.500 m! 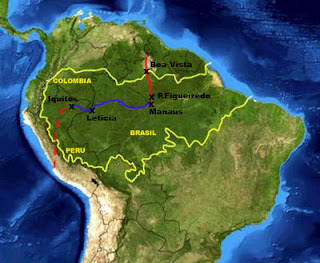 Over an area of more than 50 km long. The park is famous because of the mountain gorillas tracking. But this is not for everyone´s budget! And Rwanda is the most expensive of the 3 countries to see the gorillas (Uganda is the easiest place). The low slopes of the volcanoes are populated, fertile land. Many villages. We didn´t visit the park, it´s out of reach for our small budget.Very expensive activities in Volcanoes NP!!! 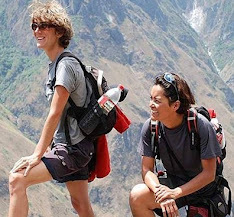 To climb the volcanoes, you need a guide (Karisimbi 300$/group 2 days, Bisoke 75 $, Ngezi 55$). Karisimbi is the highest volcanoe (4.507 m), west of the park. Prices are from the NP headquarters in Kinigi. Even if we didn´t go, here´s some information about the national parks in the neighbor countries. The Uganda side is Mgahinga National Park. You can also do Gorilla tracking there (a bit less expensive than in Rwanda and probably the easiest place to do it... not as booked and distant as Bwindi Impenetrable NP). And climb the 3 volcanoes on Uganda land, also more affordable. 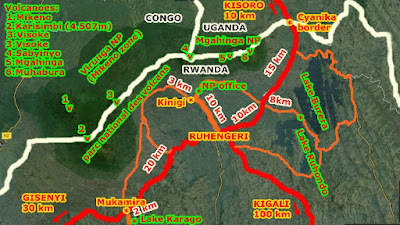 Access is from Kisoro (15 km north). The DR Congo side, Mikeno Area, is part of the Virunga National Park, opened for tourism now. Access is from Bukima, 60 km north of Goma. There are a few villages... but no idea if public transport. A private transfer is 100 $/pp!!! The Gorilla tracking is 400 $/pp, the chimpanzees 100$/pp, from Bukima NP post. Nyiragongo (the world´s largest lava lake) at 3.470 m, is also in Virunga NP, but in another area, Kibati, 10 km north of Goma. The climb is 250 $/pp from Kibati. A private transfer is 30 $/pp! All the information is on the official website of the park, www.visitvirunga.org. It´s more like a travel agency, then even do your Congo visa.